Back in February, we launched Google Buzz for mobile, a tool to start interesting conversations when you are out and about. 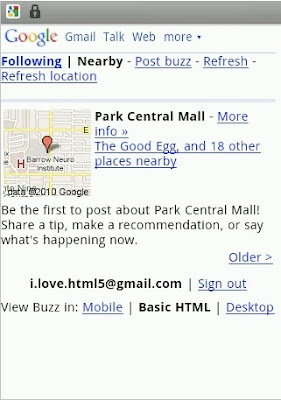 One of the most popular ways to access Google Buzz for mobile is through the web application (by going to buzz.google.com in your phone’s browser). When Buzz launched, it was only available for devices running Android 2.0+ and iPhone. Not any more! Today we’re a releasing an XHTML version of the Buzz website which can be accessed from many other mobile devices, including those running Android pre-2.0, Blackberry, Nokia S60, and Windows Mobile. Just type buzz.google.com in your browser. Then when you log in using your password, you will be able to view the stream of buzz posts, post publicly or privately, comment or like a post, and more. On the BlackBerry platform, you can also enable location through your browser settings. This will allow you to get to the Nearby view, where you’ll find geo-tagged posts near you. In addition, you can tag your post with your location. Please note that location features might not work on some devices. Android pre-2.0 devices can now run the same web app as newer versions of Android. You can also switch to the XHTML version if needed, and we will remember your preference. We have worked hard to make Google Buzz for mobile accessible on more devices in more locations. It is now available in 37 languages through buzz.google.com and we’re excited to bring it to mobile devices with browsers that don’t support the HTML5 capabilities the webapp uses. 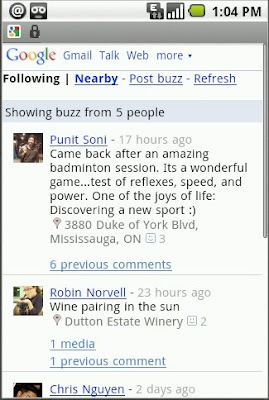 We hope that you enjoy using Google Buzz on the go! Update 5/27/2010 11:17: This new webpage is also functional on Palm WebOS phones. My main problem with everything google is that every post, help area, and app leaves out Palm WebOS, when WebOS is more open about their platform than android is! Hi Justin - We just updated the post to include the fact that this works for WebOS as well! What about Nokia N900? When I open buzz.google.com, I get the same page that I get on my laptop. Is there any way to force XHTML version? This is cool....BUT, will Windows Mobile ever get a real live APP for anything Google? dalydose, I have GMail and GMaps as real Windows Mobile apps on my Dell Axim X51v... GMail is native. GMaps is in Java. Can view just fine on my Fuze w/ Opera, but can't post anything to Buzz. Still useless as a mobile social tool Google - Fail. Thanks for updating regarding WebOS, it bothers me as well that often in Google documents and postings, WebOS gets ignored. There's still no mention of WebOS in the article. It's just been tagged. Can we mention it in the article for those that read, well, the article? How come it hates Opera Mobile 10 (on Windows Mobile) and insists that we use a "mobile browser"? How about location awareness for webOS? Google wrote the Google Maps app for webOS, so it shouldn't be too much trouble. Get Latitude working while you're at it. Does Android feel so threatened by webOS, that it treats webOS users like neglected step-children? More to the point.... Google Apps. I can't (indeed won't) start using Buzz, until I can do so under my EXISTING Identity, rather than having to create a whole new one all over. 2) why you can't post directly from the home page? you can do it that way in mobile twitter and facebook web sites, it is more natural and more desktop alike UX. I think these two issues are easy to implement and will make xhtml buzz look more like first class citizen in mobile social sites. I recently upgraded to the latest release of Latitude, 4.2.0 from 3.4.something and the latest release seems to only want to work in the vertical mode with they keyboard the only way to interact with Latitude. Maybe the auto-detect on my device defaulted to the wrong device?